Kalyves is a large Cretan village, not just something that was created out of nowhere for tourists and this is part of the charm of the place. Kalyves lives all year around. The countryside around the village is one of the greenest in Crete and the backdrop of the White Mountains is beautiful. 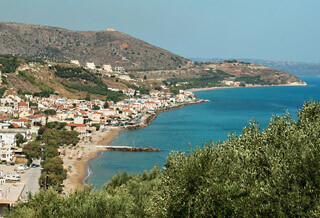 Kalyves is located about 20 km to the East of Chania. There are frequent buses along the national road but the bus will let you off about 1 km away from the village. If you don't want to walk there are also several buses a day from the centre of the village to Chania. There can be a lot of tourists in summer and it is a big village all year around but it remains a fairly quiet place. A good choice from hotels and rooms to self-catering studios and apartments. The village has a number of restaurants and eating places. Because of the recent building boom in the region of Apokoronas Kalyves has become affluent and many shops have opened to cater to the needs of new house owners. Nowadays you ccan find almost everything in Kalyves. There are a few bars and there might be a disco running in the summer. Several sandy beaches. 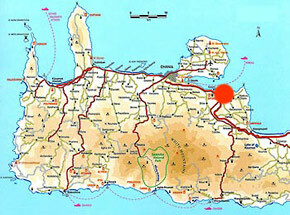 The western beach is quietand about one km away from the village. The eastern beach is in the village so gets more crowded.